Bendigo Cycles is a well known and trusted business, who needed a refresh of their business cards to match their outstanding brand. We opted for a die cut rounded edge which captures their branding in a physical sense. Die cut edges like this create a point of difference when distributing and handling business cards, and this was the perfect companion for their round, flowing brand. Using their inverted logo with a slight fade on the black backdrop adds a layer of depth to their already striking contrast of white, red & black. 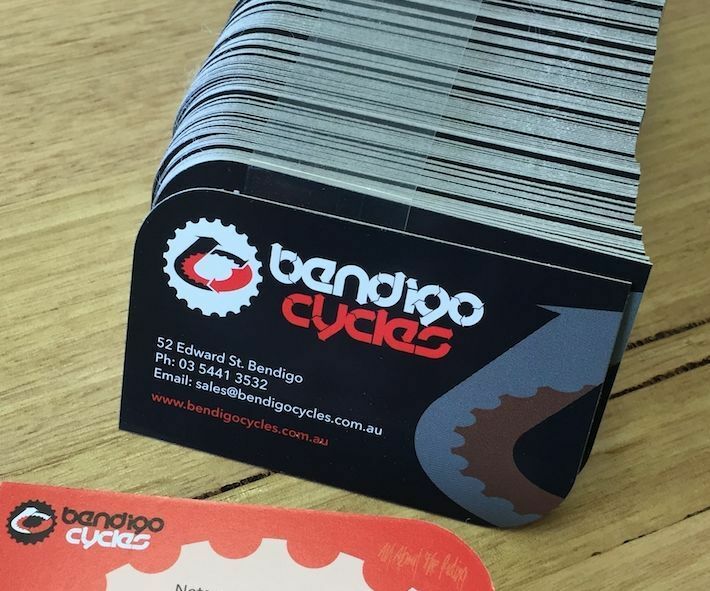 With our prompt turnaround & quality finish - Bendigo Cycles has added some amazing business cards to their flourishing brand. If you need die cut or custom cut or print business cards, contact a Mint Signs team member, and we'll help you out today!